Can the Dow Rally with Declining Bank Stocks – ABSOLUTELY! ANSWER: Just because the Dow rises, it does not mean that every sector rises. In 2000 it was the Dot.COM rally that was the focus. During 1907 it was the Railroad stocks. During 1929 it was the industrials led by Autos. Every rally is different despite the fact that the market rises overall. The bank stocks will NOT be the high flyers. Look closely at the events during the 1929 bull market as the Dow was making new highs, some stocks were collapsing including all the commodities. Look at Homestake. It began to break out only in 1931 when things were crashing. Homestake was not making new highs with the market in 1929 because commodities peaked in 1919 and began a 13 year bear market. The Dow can rally like it did into 1929, but the bank stocks will not any more than the commodities did. 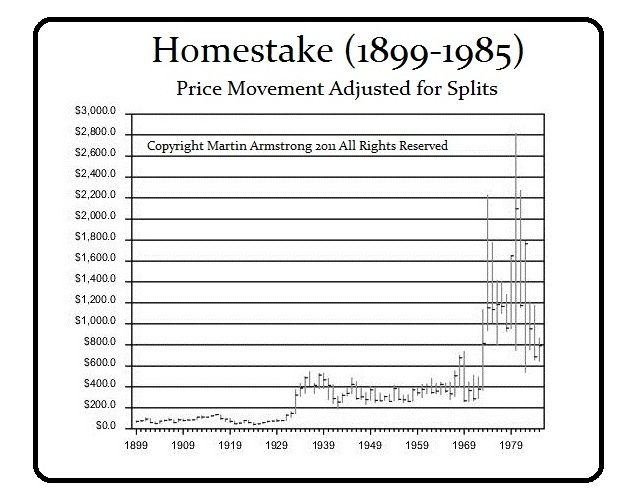 Homestake rallied only when the 1931 Sovereign Debt Crisis began. The bank stocks will NOT be seen as a safe alternative. That has nothing to do with the market overall nor will it prevent capital from shifting. Facts are facts. Opinions everybody has one. Big deal. My opinion; we will not reach the Mad Max event. But that is a personal hope. We may blow everybody up before then anyway.